Derek Farrar wants people to know about wood. 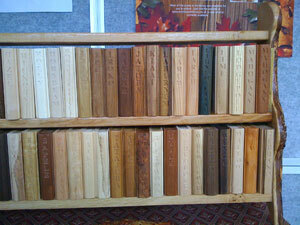 He has created a series of book-shaped samples of different timbers. Each one has routered into it the common English name of the tree it comes from and the Latin or botanical name so they are easily identifiable. Through his website "World Woods Library" Derek sells these "books" so that people can build up their own collection of different woods. Typically these cost about £18 each though he charges a bit more for the rarer woods such as holly and ebony. My own collection - which I bought from Derek - has 20 different woods in it, including a bog oak wood book which is 4,500 years old. 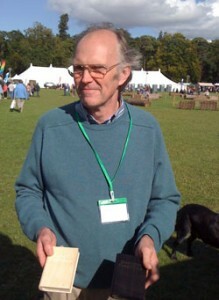 Having spent his life working in woodlands and with timber, Derek has a good idea how much there is to learn about wood and his plan is to grow and grow the range of available books. So far there are over 80 possible woods available to buy. The project is never ending in that there are over 10,000 different woods that could theoretically be used; even now new trees are still being discovered from time to time. Customers use these wooden books for professional purposes (architects, educators and designers) but also for enjoying the sheer natural beauty of the wood. The idea of a wood library isn't new and is technically called a xylarium (from the Greek xylo meaning wood and -arium, meaning repository) but most of these xylariums exist for research of scientific purposes and are not generally available. Such libraries illustrate the range of properties that are covered by our term "wood". For example, to take density, the lightest wood in common use is Balsa which typically only weighs 160kg per cubic metre whereas the heaviest, Lignum Vitae, weighs 1,300kg per cubic metre (in other words it is 8 times as dense). Wood also varies enormously in texture, appearance and colour. All these differences and others can be experienced by holding one of Derek's wooden books.